Retreatments are kept as individual treatments and can be analyzed separately (as well as part of the initial treatment). Up to 4 treatments, 1 initial and 3 retreatments, can be entered per eye. 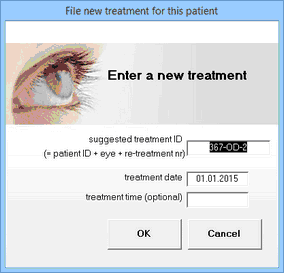 To file a retreatment click on the * box next to the OD / OS button on the data entry form. The * box will change and display a '2' for second treatment (or '3' for 3rd treatment) of the same eye. A new treatment number will be suggested ending with a '-2' or '-3' for second and 3rd treatments. 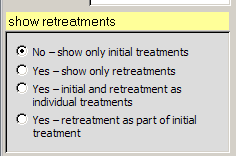 If a re-treatment is selected, the follow up data area is marked in red. 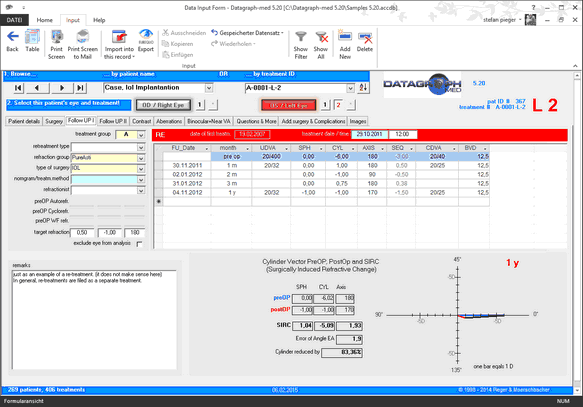 Datagraph-med will automatically copy the last follow up data and refraction values of the previous treatment and used as a pre-op value for the re-treatment. The follow up interval labels ('month' column) start again from the date of the re-treatment. Re-treatments can be analyzed separately, as part of the initial treatment (= initial + touch up's) or together with initial treatments. See 'filter graphs' for more details.